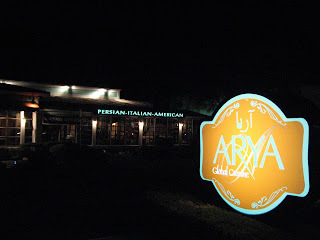 Arya Global Cuisine: Persian, Italian and American says the banner. Hmm, interesting combo methinks as I walk into this restaurant on Stevens Creek and Blaney, Cupertino. Turns out this new eatery has opened only about five weeks back. 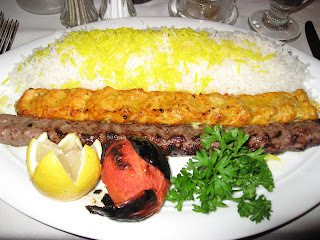 The Persian owners ran an Italian restaurant in the Orange County area before they moved to the Bay Area, which explains the rather unusual combination of cuisine they serve here. However, I must warn you that the menu is mostly Persian with some Italian dishes and hardly anything that seems American! The decor is beautiful and classy: the colors, the paintings, the granite, etc. Everything is bright and new right now, as you can expect. Starters include the Tadig, which is a crispy rice dish topped with three different sauces of Gheimeh (tomato, yellow split peas), Ghormeh (leek , parsley, spinach, coriander), and Fesenjoon (walnuts and pomegranate). Entrees include staples such as the Chelo Kebab Soltani, Lamb Kebab, Baghali Polo which is stewed Lamb Shank with dill rice and Gheimeh Badmemjoon which is made of fried eggplant in a tomato sauce, yellow peas & onions. I ordered the Kubideh combo: Persian kebabs that are very mildly spiced when compared to their Indian brethren, made of finely minced beef and chicken. These skewers of meat are served with a large amount of buttered Basmati rice and a grilled tomato. The Kubideh was excellent; the skewers were juicy and succulent and spiced just right. In fact, this is probably the best Persian food I have eatan so far. 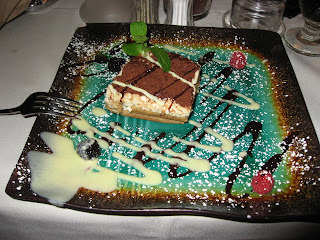 For dessert I ordered the Tiramisu which is made fresh every day. This too turned out just perfect. The menu contained other interesting Persian dishes I haven't seen before including stews (Khoreshts) made with minced meat and vegetables that were intriguing, and usually not available in the run-of-the-mill Persian restaurants. I expect to try these out in future trips; this place is within walking distance of The Cypress where I usually stay. Service in this restaurant was very good, so all in all a great addition to the Bay Area dining scene. The Ultimate one can say. @harakrishnaji: Thank you for being a regular here!